This is to inform everyone who sat for the UTME 2016/2017 session and scored 180 above that JAMB has enabled her Admission Checking Status Portal for the 2016. What this means is that you can check online if you have been given admission into any tertiary institution in the country. This is to inform the general public that NABTEB has released her 2016 May/June examination result. This is necessary as most tertiary institutions are yet to decide concerning this year's Post-UTME Screening Examination and Admission. Notice of Screening Exercise for 2016/2017 Academic Session. IAUoE wishes to inform the general public and especially those who chose the school as their first Institution of choice and scored 180 and above in the just concluded JAMB examination, to register for the screening exercise. This is to inform the general public that Imo State University has announced the sales of her Admission Screening Forms to prospective students for Admission to all courses and programmes for 2016/2017 academic session. This post is to all those who sat for the 2016 WASSCE and are currently checking their result. 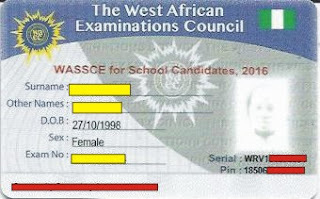 It has come to our notice that the WAEC Result Checker is currently out of circulation, making it really difficult for some candidates to check their results.